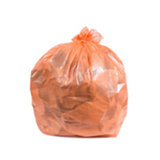 Can liners - This is the industrial/commercial term for garbage bags. 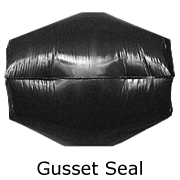 View liners for common trash cans. Flat seal - The most basic way to seal a trash bag, a flat seal is a two-dimensional bag with a bottom seal (think of a pillow case). Flat seals are generally resistant to leaks; however they don't conform very well to many garbage cans. Gauge - A term used to describe the thickness of a trash bag. 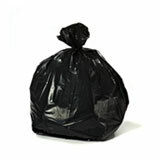 Thin garbage bags (high density) are measured in microns. Thicker trash bags (low density/linear low density) are measured in mils. Standard trash bags have a gauge ranging from 0.7-2.0 mils. 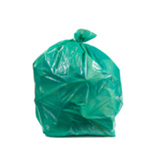 Gusset seal - Gusseted trash bag are sealed on the bottom and the sides are tucked in to form gussets, or extensions. 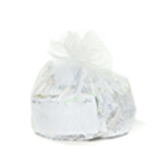 Trash placed in a gusset sealed bags tend to spread to all areas of the bag, making this is a popular choice for many types of trash cans. 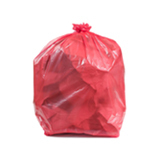 Depositing wet trash and liquids should be avoided in a gusset sealed bag to avoid leaks. The widths of the gussets are often included in the total width of the bag. For example, a 20 inch wide bag, with 5 inch gussets on each side would be stated as 30 inches wide. Most of our low density liners have a gusset seal. High density polyethylene (HDPE) - Liners made from this type of plastic/resin are generally thin, making them more prone to tears and rips. However, they are good for carrying heavy loads and are temperature resistant. HDPE is used to produce milk jugs, detergent bottles, butter tubs and water pipes. One third of all toys are manufactured from HDPE. Linear low density polyethylene (LLDPE) - Bags made with this form of plastic are highly resistant to punctures and tears. These properties make it the best choice when additional strength and stretch are required, such as for contractors. 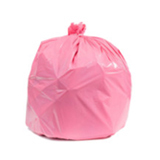 In addition, LLDPE trash bags are a smart choice when throwing out items with sharp or jagged edges, including wood, plaster, glass and items with nails. Low density polyethylene(LD) - An outdated resin still used mainly in lower end utility liners. For the most part, low density polyethylene has been replaced by linear low density polyethylene. 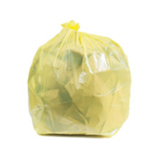 We only use linear low density polyethylene in the bags we manufacture and sell. Microban® - Antimicrobial protection that helps control trash odor by inhibiting the growth of odor-causing microbes. 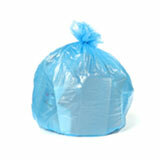 Many of our trash bags contain Microbran® as an added feature to help with smelly trash. Microbran® is registered with the US Environmental Protection Agency (EPA) for all of its applications. Micron - A micron is one thousandth of a millimeter (.001). 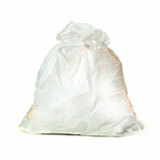 Microns are used to measure the thickness of high density trash bags which usually range from 6.0 to 22.0 microns thick. To give you an idea of how thin a micron is, a typical paper is around 100 microns thick. Mil - A mil is one thousandth of an inch (.001). 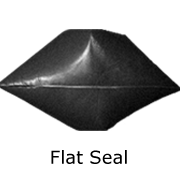 Mils are used to measure the thickness of low density liners which range from 0.7 to 6.0 mils. Standard kitchen bags are typically 0.9 mil while contractor bags usually start at 3.0 mil. Overhang - The extra few inches of the garbage bag that’s meant to hold the bag around the rim of the can to prevent it from falling in. Rubber bands are a great way to keep the overhang clinging to the top of the can. Four inches is a good length of overhang to shoot for. Polyethylene - One of the most common plastics, polyethylene is used to make trash bags, shopping bags, bottles and containers. PlasticPlace uses mostly linear low density polyethylene and high density polyethylene for our bags. Post- consumer and post-industrial polyethylene - This is made from recycled post-consumer plastics such as milk jugs and industrial scraps. These are reprocessed and blended with other types of resins to produce new high quality liners. Resin - The essential raw material from which trash bags are made. There are three types of resins: low density, linear low density and high density. Star seal - Also known as an “X-seal,” a star seal is the most commonly found seal today. 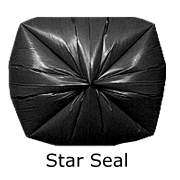 Created without gussets and sealed in a single spot, a star sealed bag is virtually leak-proof and can hold very heavy or wet trash. The unique design also allows it to conform to any size trash can with ease. All of our high density bags have a star seal.